An aerial map showing the Braddon and Turner sites on Northbourne Avenue. Photo: Supplied. The former Northbourne Flats public housing sites have been released for sale by tender with potential buyers having to adhere to specific quality design conditions and consider their location on the gateway route into Canberra and proximity to light rail. 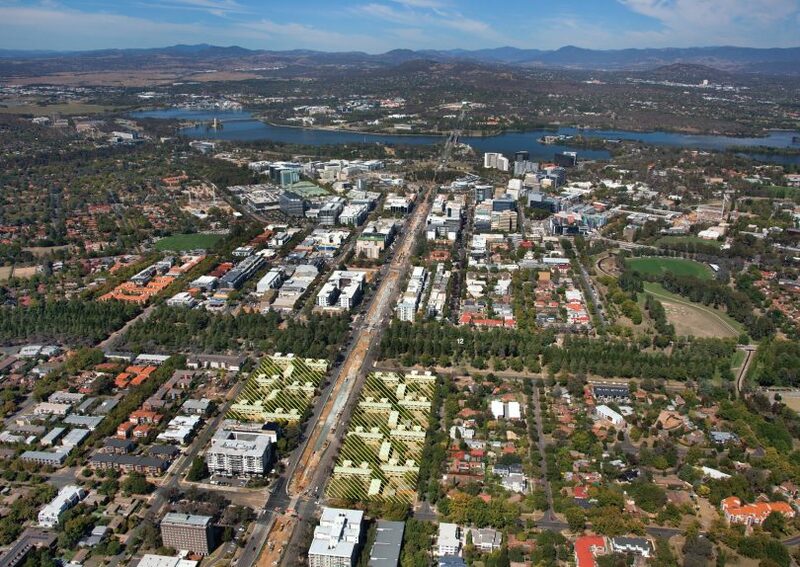 The City Renewal Authority is conducting a tender process on behalf of the Suburban Land Agency, for Braddon and Turner on Northbourne, a combined 39,000 square metres of prime mixed-use land linking the city centre with the inner north. The two blocks are part of the Asset Recycling Initiative and sit on either side of Northbourne Avenue to the north of Haig Park. They are zoned CZ5, mixed-use commercial. The Authority said proposals would need to include a masterplan for the two sites that considers the previous Weave Design for the site, which was selected as the winner of a design competition in 2011, as well as existing site constraints, the interface with Haig Park, the City and Gateway Draft Urban Design Framework, light rail and other site opportunities. According to the tender documents, the Weave Design incorporates sustainability elements and proposes a series of tall slender towers forms that are subtly angled away from being perpendicular to the Avenue, creating a ‘symbolic stitching across the Avenue that allows for views between the opposing forms’. The documents say the proposals must provide high quality private and public realms, active ground floors, and support a sustainable community including low-carbon living and green spaces, including bike parking, community gardens and central communal spaces. Proponents would also need to demonstrate how they would adopt a people-focused approach to the redevelopment and include a place proposition plan and community consultation plan. City Renewal Authority chief executive Malcolm Snow said releasing the two sites together by tender allowed for design quality to play an important role in the sales process. “Braddon and Turner on Northbourne are very important sites in the renewal of our city precinct and we want to see designs that reflect their importance to Canberra,” Mr Snow said. “The two sites are being released as a package because they need an integrated design that unites the two sites as a cohesive precinct that welcomes people to the heart of the city. The Authority said the Government Architect had been engaged to provide technical services to the tender evaluation team to ensure a high quality of design in the proposals. The successful proponent would also be required to work with the City Renewal Authority and the National Capital Design Review Panel prior to submitting development applications. Mr Snow said Canberra, and in particular the Northbourne Corridor, had undergone significant changes since the Weave design was first conceived but the Authority still wanted new proposals to reflect its principles and ambitions for a coordinated precinct,” Mr Snow said. The sales agents are JLL and Colliers International and the tender closes on 4 October 2018. So many meaningless words “sustainability elements … slender tower forms … subtly angled away … creating ‘symbolic stitching across the Avenue that allows for views between the opposing forms … provide high quality private and public realms, active ground floors, and support a sustainable community including low-carbon living and green spaces, including bike parking, community gardens and central communal spaces … also need to adopt a people-focused approach …” How can a skyscraper be angled in a “subtle” way, and “symbolic stitching” huh? Real estate development is a profit driven process. It will be placed on the site to maximise profits. The units will be sized to maximise profits but not designed to suit the actual needs of future residents; it will have pretend kitchens (“symbolic”), bathrooms bigger than bedrooms and too many of them, tiny bedrooms suitable for children’s furniture but not adult beds (Q size) or enough room for a proper desk to work/study at, no storage (bikes etc), and the balconies will in the end be covered in laundry because no clothes lines will be provided (consume more energy for driers) and it will be a tower of lonely, depressed, barking dogs during the day. Seriously. If they manage to achieve the development goals as described in the article the development should be called UTOPIA!. I wonder if there will the usual stipulation that most of the apartments must be one-bedroom? Not everything you read is true. Most apartment developments in Canberra are dominated by two bedroom units. Can you actually point to anywhere in Canberra where the planning rules stipulate most apartments must be one-bedroom? It’s certainly not the case where I live. This will be a new thing. The inference here is that anything built before now had inferior quality design.